This food puzzle/toy is our go to when we need to get wiggly dogs and cats still for exams/procedures! Put a little peanut butter or cheese in it and they stay busy for a long time! And it suctions to the surface so they cannot move it around keeping them in one place. Great for things like toenails trims! Feeding Mat for Dogs: We love these snuffle mats to out our dogs regular dry food into and keep them busy. Our dogs eat from these most nights. Slows them down, gives them a mental work out, and they love it! We are kong addicts! 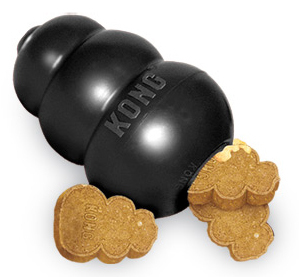 We use Kongs all of the time to feed meals in, keep dogs busy when confined, slow down their eating and more. Fill the kong with dry food and then a little canned food or peanut butter, then freeze it and it will last longer! Choose the black kong for your aggressive chewers! We are kong addicts! We use Kongs all of the time to feed meals in, keep dogs busy when confined, slow down their eating and more. Fill the kong with dry food and then a little canned food or peanut butter, then freeze it and it will last longer! Choose the red kong for your normal chewers! 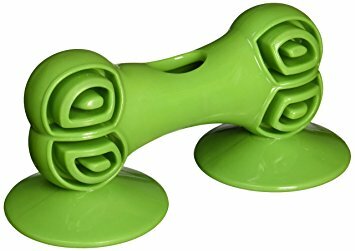 For those cats that get dry food or treats this is a great food toy! Helps them stay lean and fit, keeps them mentally stimulated, and makes their food last longer! One of Trouble the Cat's favorite things! She gets a longed stuffed with canned food every night when she is in her room. Freeze it to make it last longer! Similar to the toy above but without the treats.